Oh yes, it's 10 April 2009, a Friday! T.G.I.F! 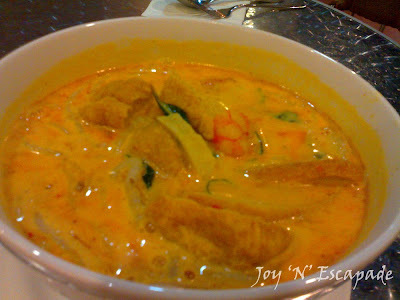 Normal price: RM15.50 per bowl (not inclusive of 10% service charge & 5% government tax). With Pocket Savers, it's RM9.90. I love its mildly hot gravy, actually it's not hot at all! If I'm not watching my diet, I'd have finished the whole bowl of gravy, which is laden with crushed dried shrimps and rich coconut milk. Apart from rice noodles, I'm also enjoying fresh prawns, chunks of dried beancurd (tao pok), and fish cakes. Not bad. Normal price: RM16.50 per plate (not inclusive of 10% service charge & 5% government tax). Not part of Pocket Savers. My sister said, it's as if she's eating pizza. 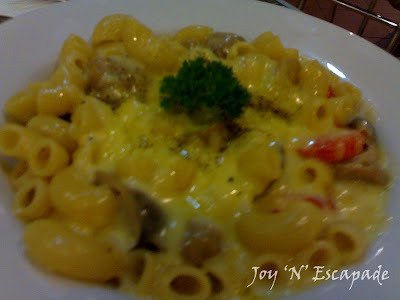 Cheesy and sticky with fresh prawns and chunks of straw mushroom (errr... aren't they suppose to use those more expensive fresh mushrooms? ), it's not a bad choice for those who love cheese and who can stand the cheesy taste as you are finishing the whole plate.